If you want to make a gift which could be remembered forever, try UniqueGift Maker. UniqueGiftMaker will help you to make your greetings, questions or anything you want to say in the form of a flash e-gift. Have you got ready for Valentine's day, Birthday of your friend or any special occasion? If you want to make a gift which could be remembered forever, try UniqueGift Maker. 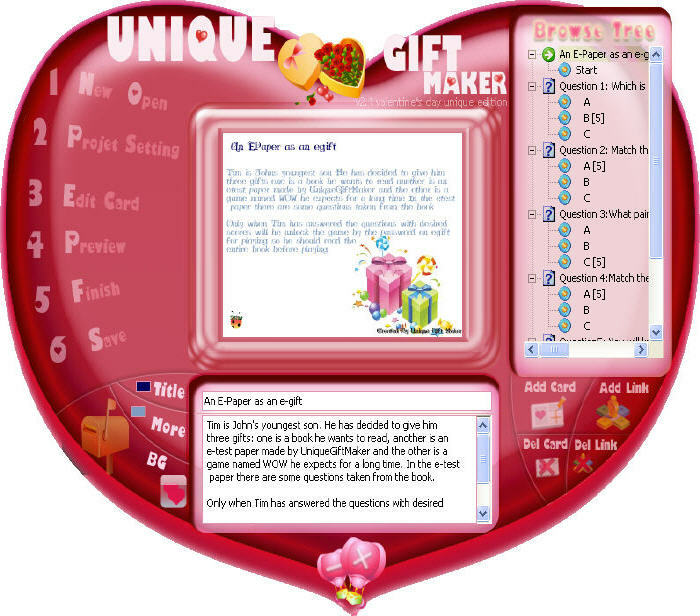 UniqueGiftMaker will help you to make your greetings, questions or anything you want to say in the form of a flash e-gift. You can use UniqueGiftMaker to create e-GreetingsCard for your friend, e-ExamPaper for your son, e-LoveLetter for your sweetheart, e-PhotoAlbum for your wife, e-Recipe for your mom, e-FunStory for your child, e-Questionnaire for your customer and e-SlideShow for your work. No matter where he is, the gift of Unique Gift Maker can be sent to him rapidly though internet. It'll be more valuable and significant. You might have to make use of UGM more than 50 times in a year (nearly once a week). Before every festival many kinds of gift's theme, background and music could be downloaded free by members. Auto get the answers from the receiver by email. It's amazing! With the useful gift maker, you are no longer boring with choosing gifts. You can make gift by yourself, the most important is that the gift is the only one in the world, so it is very special.